Jiangsu Union Logistics System Engineering Co., Ltd. Item Code:UN-PR0812 Features:Pallet Rack is a most useful and cost-effective storage racking system providing direct access to all pallets. It provides high capacity storage, is easily installed and adjusted, and cost-effective. Pallet Rack is easily installed,cost-effective and versatile,adjustable beam racking is the most widely used of pallet storage systems and allows direct access to each pallet stored.With adjustable beams,racki8ng can be re-configured to accommodate changes in the type of goods stored and wide aisles allow access by all types of truck,making specialised handing eqipment unnecessary. A. Pallets can be located, accessed and moved individually. B. Rapid handling of almost all types of pallet used goods. C. Infinitely adjustable and offering a wide range of options and components to accommodate specific needs. D. Maximizes space use in any warehouse configuration while retaining optimum product accessibility. E. Strength and rigidity prevents compression damage to goods. F. Bottom level of pallets can be stored on the floor, lowering structure costs. A. Loading capacity: 500-4000 kgs UDL/layer. E. Special sizes also available to specific storage needs. 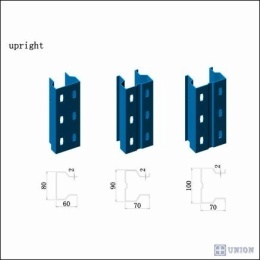 A. Upright section: 80*60*2.0, 90*70*2.0, 100*70*2.0, 120*95*2.0-2.5mm, etc. C. Horizontal & diagonal braces, upright footplates, safety locking pins, bolts & nuts, anchors and all necessary components. 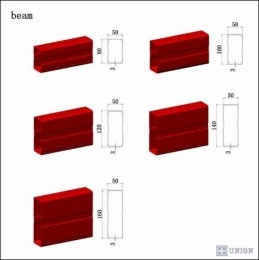 High-quality steel from BAO Steel Co. Ltd., the largest steel manufacturer in China. Pallet Rack is a most useful and cost-effective storage racking system providing direct access to all pallets. It provides high capacity storage, is easily installed and adjusted, and cost-effective.